Hair conditioner with linseed oil and honey extract. 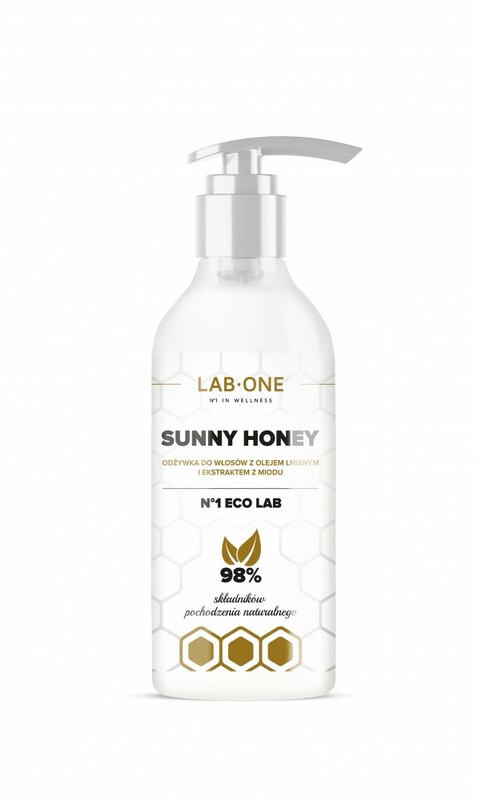 SUNNY HONEY conditioner is the perfect complement to everyday hair care. The richness of natural ingredients will nourish your hair without unnecessary weight. Vegetable glycerine with beeswax form a protective layer and protect hair during thermal hair treatment. What's more, glycerin strengthens weak and falling out hair, gives them a glow, smoothes jagged ends. Honey extract has moisturizing and smoothing effect, thanks to which the hair will be shiny and soft. The specific action of honey is noticeable with dry, damaged and dyed hair, because honey takes care of their healthy appearance. Soybean oil and inulin protect the scalp from irritation. In addition, soybean oil nourishes and moisturizes the hair, weighs them down so that they appear to be thicker, but it does not load, and also polishes, softens and prevents frizzing. Olive oil is a wealth of vitamins A, E, F and D and unsaturated fatty acids. They prevent onepement and allow you to build the structure of damaged hair. They give hair strength and shine. The oleic acid contained in olive oil additionally has anti-inflammatory properties and thus prevents the formation of dandruff. Linseed and coconut oil restore smoothness and shine to your hair. They prevent split ends and hair loss. Aqua, Cetearyl Alcohol, Glycerin, Glycine Soja Oil, Stearamidopropyl Dimethylamine, Linum Usitatissimum Seed Oil, Rosa Moschata Seed Oil, Cocos Nucifera Oil, Gardenia Taitensis Flower Extract, Mel Extract, Helianthus Annuus Seed Oil, Royal Jelly, Inulin, Alpha-glucan oligosaccharide, Beeswax, Tocopherol, Ascorbyl Palmitate, Propanediol, Citric Acid, Parfum, Benzyl Alcohol, Sodium Benzoate, Potassium Sorbate, Dehydroacetic Acid, Linalool. Apply a moderate amount of the preparation to the washed hair and spread it thoroughly. The conditioner should be left on the hair for about 5 minutes and then thoroughly rinsed with water.